I’m a geek – so of course I wanted to test out the healthcare.gov site immediately after it launched – and failed. First I wasn’t able to connect to the site and eventually when I did connect to the site it would let me go through the profile process but once it attempted to verify my identity it would drop me into purgatory and leave me there – forever and ever and ever (literally, I could leave the site and come back days later and I’d still be stuck there). 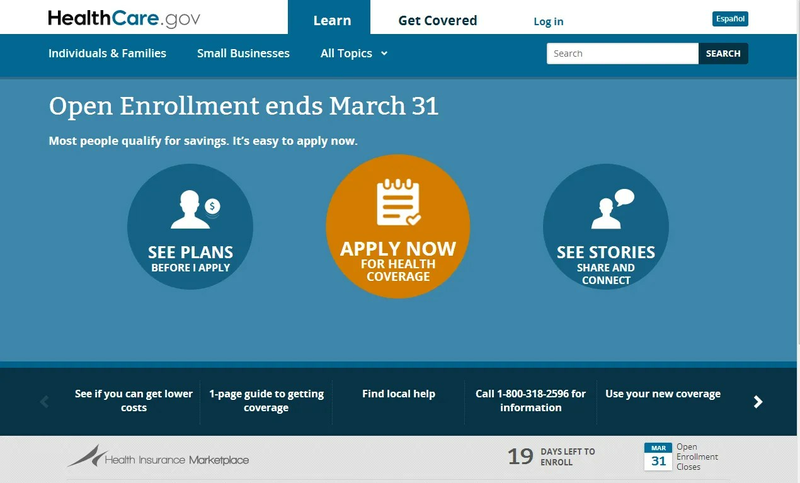 Screenshot of Healthcare.gov upper front page. I tried a couple times creating, deleting, recreating, on various days and over various months – no luck. Finally I decided to call the phone number and admit that I, an IT guy, couldn’t get the site to work for me. The phone was picked up fairly rapidly and I was led somewhat painfully through providing all the information I had already provided numerous times via the site. At the end I was given an application ID number which the representative informed me I should “enter on the site” and it would show my enrollment – but that sometimes it took up to 24 hours for the change to happen on the site. I grimaced at the 24 hour statement. While I was on the phone I attempted to pull up the application and of course it didn’t work. I had a pretty good feeling that if it didn’t work then it wasn’t going to work in 24 hours – and I was correct. The next day it still couldn’t find my application ID and weeks and even a month or two later it still could not find the application ID. People have been noting how few younger people have been signing up through healthcare.gov and I wonder – does the system, for whatever reason, have problems with younger individuals? I don’t mean that it is intentionally discriminatory, but that the data about older individuals is more readily available, organized differently, etc. For example, it may be that older individuals already are “known entities” to the system b/c they have utilized services like Medicare. Just a thought. But it is all done, I’ve signed up for the Keystone Health Plan East HMO Silver Proactive. Cost is less than $230/mo. (unless the premium changes, which I have heard happens…). This may be a decent jump for young folks in good health compared to pre-Obamacare, but for me it is a huge drop. Since I have pre-existing conditions Keystone would have charged me around $600-$700/mo. for health insurance…which was just impossible for me (and thus I have been without health insurance for over a year now). Ohh, but the real reason I wanted to tell you about this is b/c something bad happens if you don’t have health insurance by the end of March…which I think most people know (I know a fine…and I think “open enrollment” closes which means you can’t get healthcare until the next “open enrollment” occurs – which might not be for a few months), but perhaps more important – if you want to have coverage as of April 1st you need to be enrolled in a plan by March 15th. If you are registered after March 15th, your insurance policy won’t “start” until May 1st! Next story What You Didn’t Know About Your Local Library. Previous story Shakeology – 4 Month Update.